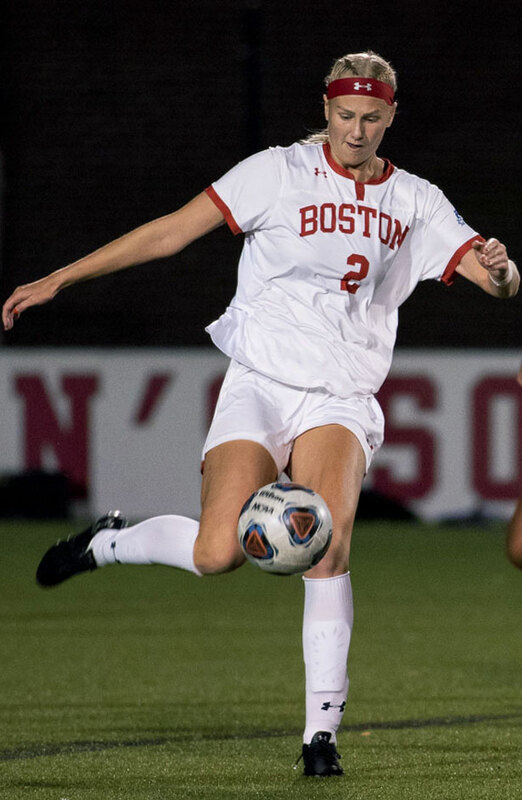 With its final regular-season game around the corner, members of the Boston University’s women’s soccer team have said they believe pieces are in the right spot to make a postseason push. The Terriers (8-7-3, 6-0-2 Patriot League) will be going to Hamilton, New York, to face Colgate University — the current Patriot League leader — without a loss in conference play and every win coming off a shutout. For the first time since 2015, BU won against Bucknell University Saturday. The two teams last faced off in the 2017 Patriot League Tournament, where Bucknell (7-9-1, 5-3-0 Patriot League) knocked the Terriers out in the semifinal match with a 1-0 win. The victory came in a 2-0 shutout where the Terriers outshot the Bison 12-5, ultimately forcing Bucknell goalkeeper Theresa Adu-Attobrah to make six saves. Junior midfielder Chloee Sagmoe led the attack, stacking up three shots on goal during the course of the match and notching the game winner in the 41st minute. Sagmoe’s play earned her the first Patriot League Midfielder of the Week recognition of her career. The win extended the Terriers’ home conference win streak to 48, the longest in the NCAA, and moved them into sole possession of the second spot in Patriot League rankings. Before the Bucknell game, BU Athletics held a ceremony to acknowledge the 10-woman senior class. Feldman said that the win was the regular season home send-off she had hoped for. The class includes the team’s three captains, defenders Libby Closson and Pietra Sweeney, and midfielder Dorrie Varley-Barrett. In the match, Sweeney was able to assist on a goal from a third senior defender Royce Light, her first goal against a Patriot League opponent. Outside of two 1-1 ties against American University and the United States Military Academy, BU has not allowed a goal-against in its six other conference games. According to Feldman, keeping the ball in the offensive third of the field has been key in keeping the Terrier net empty. BU is second in the Patriot League with an average of .237 goals allowed per game. The third best in the league, the United States Naval Academy, has allowed six goals in conference play for an average of .723. Despite the focus on the attack, the Terriers have been backed by stellar performances from its goalkeepers as well. Freshman goalkeeper Morgan Messner has been in net for four of BU’s shutouts and has not allowed a goal from a conference team, making her the only Patriot League goalkeeper with a perfect save percentage. Messner got her first start in net as a Terrier after an injury kept sophomore Amanda Fay out of play for three games early in the season. Fay has made seven starts since then and put up a .703 season save percentage. Sweeney said the team’s defensive strength has come from experience. BU started the season going 1-1-7 in out-of-conference play. It took the Terriers six games to pick up their first win, and after that, it would take until their second conference game against Lehigh University Sept. 22 for them to pick up a second victory. Since then, BU hasn’t lost a match. Feldman described one hindrance — the loss of senior midfielder Julianna Chen for nearly a month — as a chance for freshman midfielder Taylor Kofton to grow as a player. Kofton started her first game as Terrier Oct. 13 against West Virginia University and has since collected four goals, putting her in a three-way tie for most in-conference goals. While Feldman said the losses made believing in the system difficult, recent success has resulted in more confidence among the team. Saturday will see BU face off against Colgate (11-2-3, 7-0-1 Patriot League), who are currently two points ahead in the Patriot League standings. With a Raider win, they will claim the regular season title and home advantage for the conference playoffs. The Colgate team will walk onto Beyer-Small ‘76 Field with a seven-game win streak and five-game shutout streak. In their most recent match, Navy (10-5-3, 6-2-0 Patriot League) held off the Raiders until the 109th minute when Colgate midfielder Mara Cosentino scored her sixth goal of the season for a 1-0 double overtime victory. Cosentino and Raider goalkeeper Kelly Chiavaro earned back-to-back Patriot League honors last week. While Cosentino leads Colgate in scoring with 12 points, Chiavaro is in the top 10 nationally in save percentage, goals against average and shutouts. Feldman said her attack-first strategy is the same against every team.